Revenge of the Nerd - The Consultant, Helping Fast GT-R's go Even Faster! Mike Kojima from MotoIQ accompanied SP Engineering, Greddy, and Hing to the Las Vegas Motor Speedway, as part of the Nerd Alliance to help them with suspension setup. If you can make a car go fast, Mike can help you make it go faster. Mike has helped me in years past with some other GT-R's, and see's and understands suspension more than most of us ever will. What I noticed in the videos, from the two 8 second cars of this March, were how different they looked going down the strip. The AMS car went quicker and faster eventually, but on a few passes it looked very out of shape. 60 foot time is very important in quarter mile ET's. The old rule of thumb is about 0.2 seconds for every 0.1 of 60 foot time. 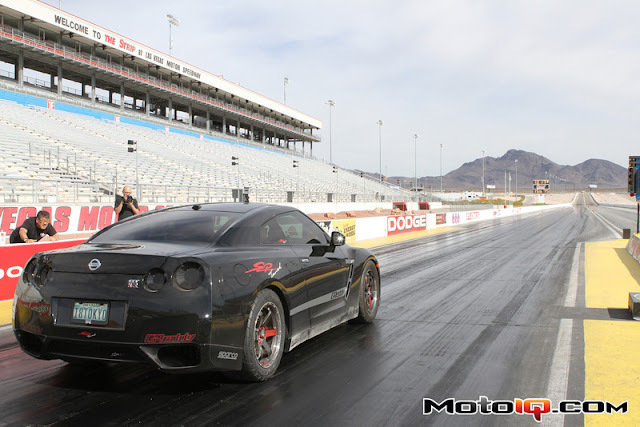 While a 1.4 60 foot time is good for a all wheel drive R35 GT-R, some drag cars go deep into the 1.2 second range on an 8 second pass. 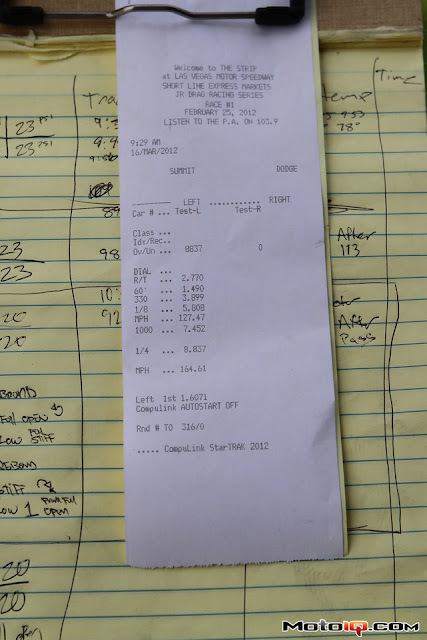 A couple of weeks ago, I got a call from the folks at Greddy Performance Products and KW Suspension to help with an effort to break the 1/4 mile record for a street driven full body R35 Nissan GT-R.
My part in the mission was to help pare down the 60 foot times and I gladly accepted the challenge representing KW Suspension. I would be working with Chris Marion, who helps me in Formula D. Chris and I work together quite a bit and I really enjoy working with him and KW. SPL Parts provided adjustable links for camber and rear toe. SPL bearings also replaced the stock rubber parts in the spindles. Getting rid of the rubber will help reduce flex and wheel hop that drag GT-R's experience. Before we got to the track, the crew set the alignment to our specs so all we had to do was turn knobs! Head over to the MotoIQ article for an in depth analysis of the then record breaking 8 second passes. RWD cars running 8's are doing it with a 15" bias ply slick as opposed to drag radials. That is why they are 0.2 seconds faster. Not only that, but most RWD cars in the 8's are stripped out and probably weigh less than a full weight R35 GTR.